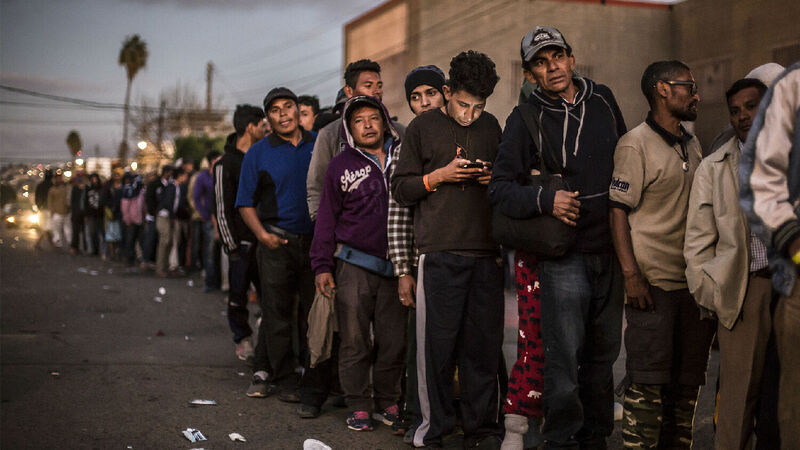 Migrants queue at a food counter along the U.S. border as they await entry into the United States. President Trump’s proclamation invoked national security powers, delegated to his office by Congress in 1952, to suspend for up to 90 days asylum rights for migrants who illegally cross into the U.S. The Supreme Court decided in Trump v. Hawaii that Section 212(f) of the Immigration and Nationality Act entrusts the president to temporarily suspend entry to any group of aliens he deems detrimental to the interests of the United States. The U.S. Conference of Catholic Bishops apparently disagrees with the Supreme Court. Bishop Joe Vásquez, chairman of the U.S. Conference of Catholic Bishops Committee on Migration, and Jeanne Atkinson, executive director of Catholic Legal Immigration Network, both signed this statement. Atkinson’s signature is significant, since the Catholic Legal Immigration Network is part of the cara Family Detention Pro Bono Project. Along with immigration rights group Pueblo Sin Fronteras, the cara Family Detention Pro Bono Project helped organize a caravan of Central American migrants seeking asylum in the U.S. last October. The U.S. Conference of Catholic Bishops claims that its goal is to “accompany and assist” migrants fleeing persecution, but the Catholic Church has done little to help these migrants in their home countries. Instead, priests and bishops across Latin America are helping them leave their countries to enter the U.S. illegally. One reason the U.S. Conference of Catholic Bishops acts like an open-borders lobby is that it receives thousands of new parishioners and billions of dollars by encouraging mass immigration into America. According to a report by the Capital Research Center, Catholic Charities and the U.S. Conference of Catholic Bishops received over $2 billion from the U.S. federal government between 2008 and 2015. This money is paid out in return for Catholic assistance housing and resettling refugees in dozens of communities across the nation. Catholic Charities agencies typically resettle 25 percent of all legal refugees admitted into the U.S. each year, along with an unknown number of illegal immigrants. By calling on the government to increase the number of migrants and refugees allowed into the country, the U.S. Conference of Catholic Bishops protects its annual flow of hundreds of millions of federal dollars. In addition to this monetary benefit, encouraging mass immigration from Catholic-majority countries brings new parishioners into the U.S. Catholic Church. San Diego bishop Robert McElroy stated in 2016 that mass deportations of illegal immigrants could remove 10 percent of Catholic parishioners from American churches. This makes the illegal immigrant community a powerful demographic within the U.S. Catholic Church. Pew research data shows that 67 million people identify as Catholics in the U.S., roughly 21 percent of the population. But for every new Catholic convert, six Catholics leave the church. About half of these former Catholics give up on religion, while the other half join a Protestant denomination. The reason the percentage of Catholics in America isn’t plummeting is because native-born Catholics are being replaced by immigrant foreign-born Catholics. Without illegal immigration, the Catholic Church in the U.S. would be a shrinking organization of diminishing influence. Immigrants moving into the country give Catholic leaders influence that they would not otherwise have. According to the Vienna Institute of Demography, if immigration into America doubled, Catholicism would overtake Protestantism to become the largest religion in the U.S. by the middle of the century. The U.S. Conference of Catholic Bishops supports illegal immigration into America as part of its long-term strategy to weaken America’s Protestant base and ultimately transform it into a Roman Catholic nation. Astonishingly, this strategy was foretold in the Bible. Both Revelation 17 and Isaiah 47 refer to the combined religious and political power of a great false church. The church known as “Mystery, Babylon the Great” in Revelation is referred to as the “daughter of Babylon” and the “lady of kingdoms” in Isaiah. This church will rule over a union of 10 nations in Europe. And because God is “wroth” with the modern descendants of ancient Israel for their sins, He turns them over to this religious power, which carries them away captive and shows them no mercy. Herbert W. Armstrong explained in his landmark book The United States and Britain in Prophecy that modern descendants of ancient Israel are primarily the U.S. and Britain. So the prophecies in Revelation 17 and Isaiah 47 are about a European superpower, dominated by religion, conquering the U.S. The Vatican is currently using the U.S. Conference of Catholic Bishops to oppose the Trump administration and help Hispanic Catholics from Latin America settle in the U.S.—legally or illegally. But soon, foreign invaders from Europe will join the illegal immigrants streaming over the Mexican border in droves. The Prophet Isaiah calls Assyria “the rod” of God’s anger and “the staff” of His indignation (Isaiah 10:5). The United States and Britain in Prophecy also explains how the ancient Assyrians settled in modern-day Germany. It will ultimately be Germany that partners with hostile nations in Latin America to besiege and invade the United States. As shocking as that sounds, the Bible makes clear that this is the punishment to come from polluting God’s inheritance. Thankfully, God tells us how we can be protected from this catastrophe. “Therefore, O thou son of man, speak unto the house of Israel; Thus ye speak, saying, If our transgressions and our sins be upon us, and we pine away in them, how should we then live? Say unto them, As I live, saith the Lord God, I have no pleasure in the death of the wicked; but that the wicked turn from his way and live: turn ye, turn ye from your evil ways; for why will ye die, O house of Israel?” (Ezekiel 33:10-11). The book of Ezekiel was written specifically for this end time. (Request your free copy of Ezekiel: The End-Time Prophet.) There is only one way that God will protect us: Our people must turn, turn, turn from our sins. God takes no pleasure in the death of the wicked. “Why will ye die, O house of Israel?” What a terrifying question! Even if the nations of Israel reject God’s warning today, they will eventually repent after they have experienced incredible suffering. Then He will make them the chief nations of the wonderful World Tomorrow. It is a matter of life-and-death importance that everyone who hears this message sit up, pay attention and take note of the seriousness of the times.